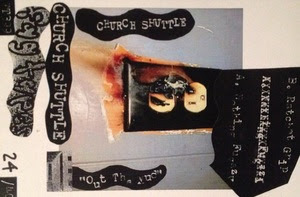 FAG TAPES: CHURCH SHUTTLE "OUT THE MUD"
CHURCH SHUTTLE "OUT THE MUD"
FT399 CHURCH SHUTTLE "Out The Mud" cassette. ALL GONE legend Chris Duram announces this new solo soundtrack recorded live to tape in the studio in deep SW Detroit. An industrial farm. Broken tapes and record players on a karaoke machine reflecting sleepless nights in the silent, warm night of a false environment. The store down the street might be open if the owner who lives upstairs is awake. The barber shop saves the hair and sells it to bread factories. Edition of 40.